Good news for anyone with a favorite show on The CW: It has probably been renewed! Today, the network announced that, once again, it has granted new seasons to pretty much show it has. The only exceptions are The 100 (which is always on the bubble for some reason), the Roswell revival, football show All American, and yet-to-premiere new series In The Dark, as well as stuff that’s already set to end this year—specifically Jane The Virgin, Crazy Ex-Girlfriend, and iZombie. 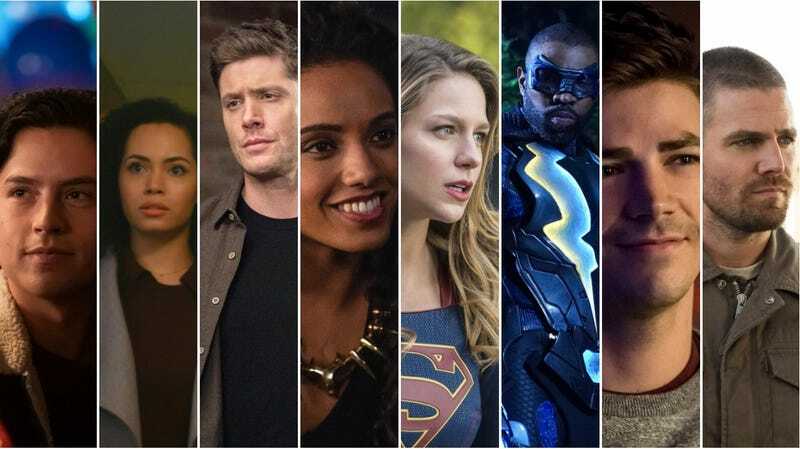 That leaves just the 10 lucky shows getting renewed: Arrow, Black Lightning, Charmed, Dynasty, The Flash, Legacies, Riverdale, Supergirl, Supernatural, and, of course, Legends Of Tomorrow. This will be season eight for Arrow and season 15 for Supernatural, bringing us one step closer to the day when those two shows eventually have a crossover of their own (or at least some meta crossover, like when the guy who played Logan on Gilmore Girls appeared in an episode of Veronica Mars, which was a show that also had a guy named Logan). We’re still waiting to hear on The CW’s new pilots, including the Arrow spin-off Batwoman, the Riverdale spin-off, and the Jane The Virgin spin-off, but those will probably get picked up and then run for 15 seasons at some point as well.